1. The current number entered. 2. Shows a shortened title for the current item, and its category. *If “Display number of Offers in Group” is checked in Program Settings, next to the letter will be a number to indicate number of offers in this group. If a letter/number is colored Orange, there are more than one offer at the lowest price in this group. For more information on groups, please see Pricing Display. 4. Number of new offers in this group. 5. Conditions for used FBA offers and number of offers in this group. 6. Number of new FBA offers in this group. 7. Numpad for manual input. 8. Showing the ‘Buy Decision’ or other special message. 9. Showing the lowest used price, followed by up to 4 lowest used prices from each group. 10. Showing the lowest New Price, followed by up to 4 lowest new prices from each group. 11. Showing Used FBA prices. *If you uncheck “Display FBA Offers Separately” in Program Settings, FBA prices will also be displayed and colored in Red. 12. Showing New FBA Prices. *If the price in 8, 9, 10, or 11 is displayed in Orange, this means that there is more than one offer at the lowest price in this group. 13. Total number of offers in new condition (Cap is at 255 offers). 16. 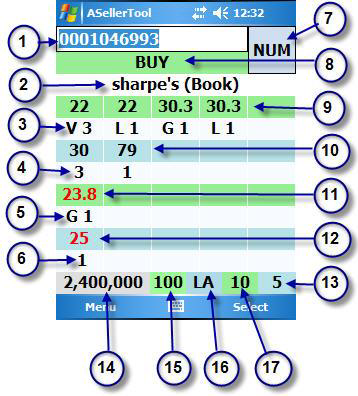 Indicates which offer is used by the program to reach a buy or reject decision. 17. Total number of offers in used condition (Cap is at 255 offers).